For me, the pinnacle of baking confectionery genius can be defined in two words...French Macarons. Macarons take cookies to an unimaginable extreme of culinary perfection. 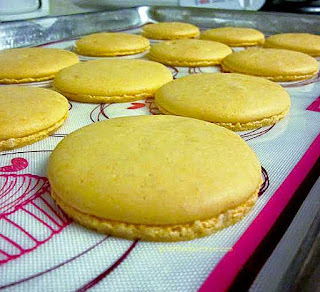 Macarons are not to be confused with the coconut cookies called "macaroons"...these almond flour cookies are made with a meringue base. When baked correctly, they have a light crisp sugary coating surrounding a tender chewy cookie interior. Two of these perfect bites of heaven are then joined in holy-happiness in a sandwich-style confection by creamy rich buttercream, truffle chocolate ganache, or tart jam. The flavor is remarkable. Resistance is futile. I save them for special occasions when I can lock myself in a closet and be alone. I also share them with people who I really love. If Elvis was alive (or ever to come out of hiding)...he'd be the first to get one of these. Seriously. 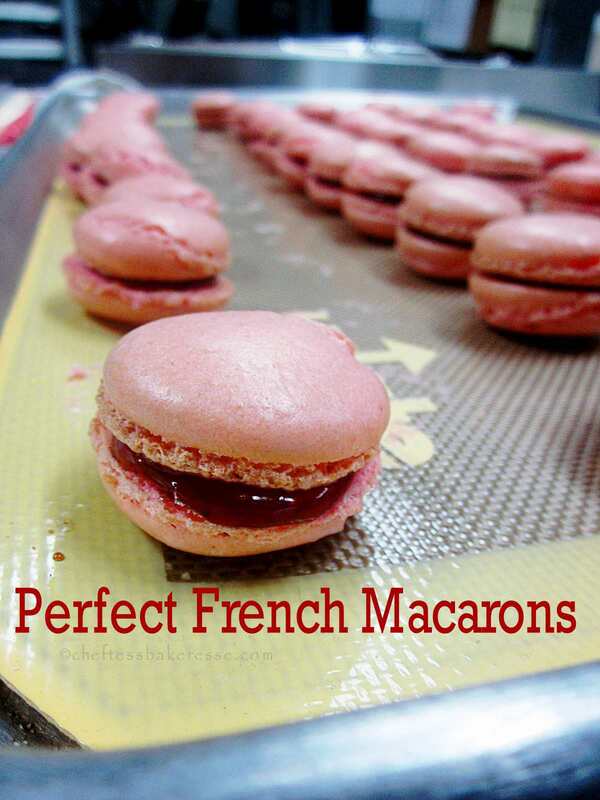 Macarons can be tricky to make, and the secret to success is of course, having a great recipe! This is the one I've used for the last few years in the bakery and for the farmer's market. The other secret: Very fine milled almond flour. The other trick I have found to making consistently awesome macarons is to carefully weigh and measure the ingredients. In fact, whenever possible, I prefer the weight of the ingredients to the volume measurements. It seems that even the slightest variation in ingredients' weight will not produce a perfect cookie. Put oven racks in upper and lower thirds of oven and preheat oven to 300°F. In a separate bowl, Mix confectioners’ sugar with almond flour and SIFT well. This is a pivotal step if you want a smooth batter that will bake well and not be "bumpy". Beat whites with salt in mixer at medium-high speed in a metal bowl mixer until they just hold soft peaks, about 4 minutes. Reduce speed to medium, then add granulated sugar, a little at a time, beating, and continue to beat until whites just hold stiff, glossy peaks (about 3 minutes). Fold almond flour mixture in 2 batches into whites until just combined. 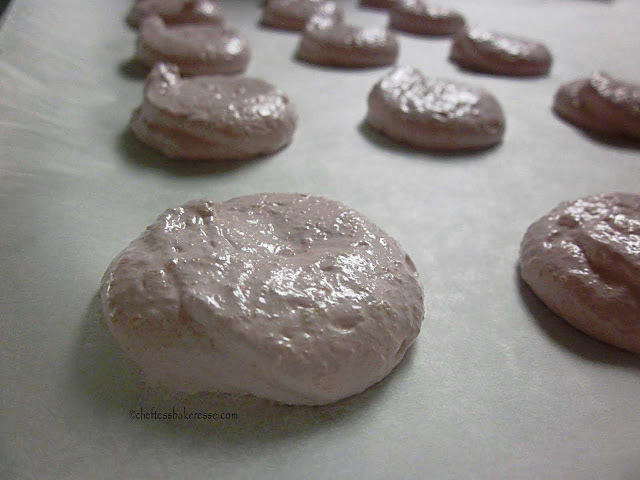 Transfer meringue to pastry bag and pipe 16 (1 1/2-inch-wide) mounds 1 inch apart on each lined baking sheet (32 total). 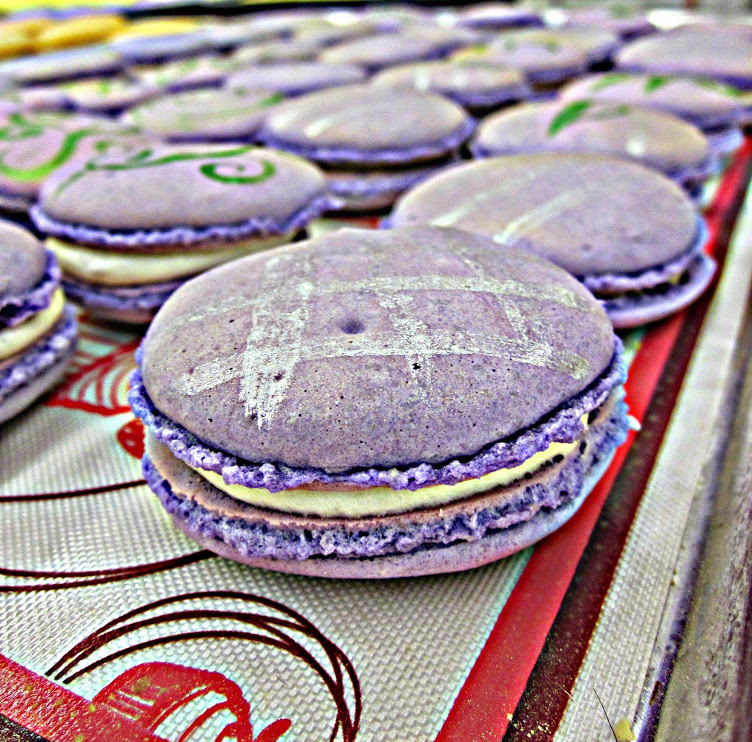 Piping the perfect macaron takes a little practice. Treat it as you would a rosette, bringing the pastry tip to the side of the circle, rather than forming a peak, to finish. I allow my macarons to sit out at room temperate on the baking paper for about 20-30 minutes before transferring to the oven. This seems to help with the smooth finish and the "foot" on the bottom of the cookie that gives it the traditional trademarked look of a true macaron. 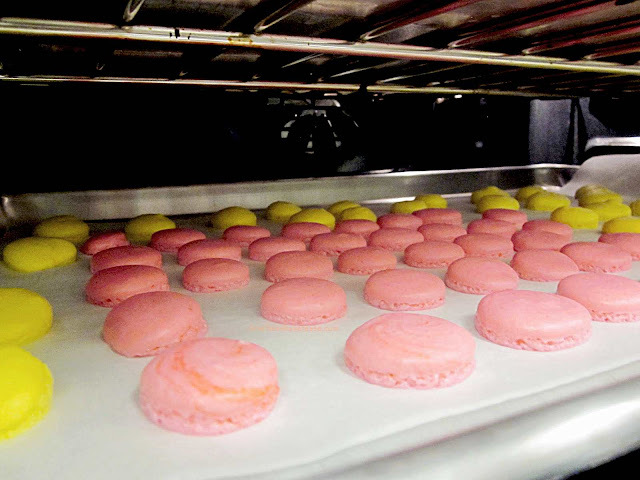 Bake, switching position of sheets halfway through baking, until macarons are puffed and tops appear dry, 10 to 12 minutes. Macarons should be crisp on the outside and chewy on the inside. You may need to sample ten or fifteen to be sure they're just right...Okay...I made that part up. 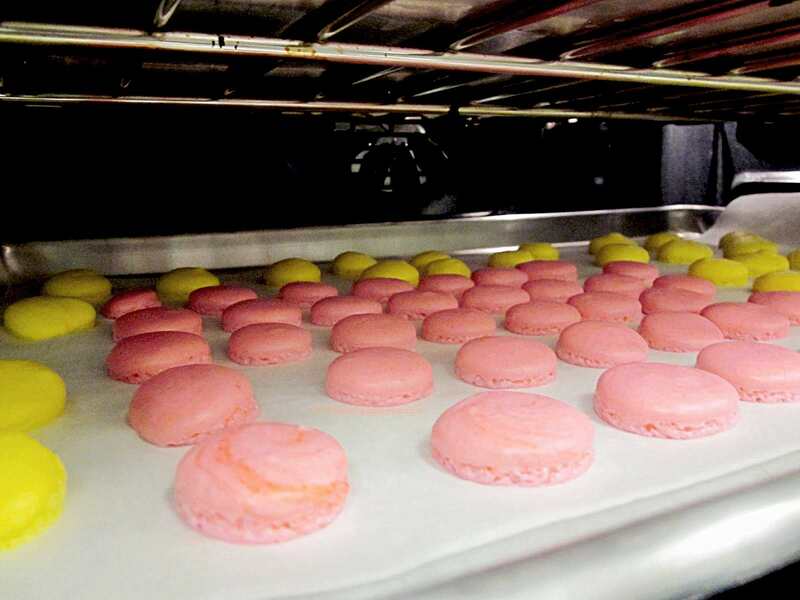 Slide parchment with macarons onto racks and cool 10 minutes, then peel macarons from parchment, transferring to a rack to cool completely, about 15 minutes. for 1/4 cup of the almond flour. There you go darlings! 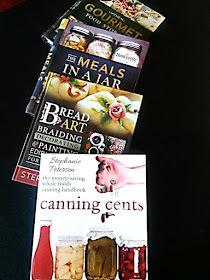 The secrets to success in baking something really classic. Enjoy!